For thousands of years the San Francisco Bay Area supported a population of thousands of Ohlones, Miwoks, and Wintuns living in a stable life system based on peaceful collectivity. The basic societal unit was a tribelet of typically about 250 people. There were about thirty permanent villages scattered around the Bay and into the delta, alongside rivers and creeks. The typical village had about fifteen houses arranged in a circle around a plaza, with a communal sweat lodge. Their houses were dome-shaped, framed with bent willow poles, between about six and twenty feet in diameter, each housing an extended family; the sweat lodges were usually twice as big as the family houses. Besides these main villages, there were other settlements used at different harvest seasons, and families and tribelets moved about throughout the cycle. The bay was also shared with tribelets having their primary villages inland, who made treks here in regular seasons for particular harvests. Most tribelets spoke different dialects, but all lived in very similar life patterns. Food was readily available, so they lived entirely by hunting and gathering; hunger was entirely unknown. Annual intertwined harvests were connected with rituals and social celebrations oriented toward maintaining balance in the natural world and among people. Among the tribelets there was a complex network of trade, marriage, gift-giving, and ritual feasts. There were occasional conflicts between tribelets or villages, but differences were almost invariably settled with gifts as reparations to wronged parties. Most hunting and gathering was done by extended families, but periodically they worked in larger communal groups. Communal hunts were invariably followed by great feasts and celebrations. Catches were divided in a ritual manner, with different parts of particular animals going to designated family members, relatives and neighbors. Each tribelet had an elder man or woman in a chief-like position, but this position held mostly moral authority, and a chief's power varied with the respect commanded by deeds. A new chief was chosen by a consensus of elders, always however from the same family. The chief's main job was to maintain the traditional balances within the village, and tribelet, and with neighboring tribelets. This included seeing to the general welfare of the community. It was considered a great personal shame on the chief if anyone in the tribelet was needy. Cooperation and sharing were virtues, and competitiveness was not. People gained status in the community through generosity. Private property in land was unknown. Families and tribelets had "collecting rights" to particular areas to gather foods, but were expected to be generous to neighbors; should a harvest in one area fail, the unfortunate tribelet or family could traditionally share in the resources of adjoining areas. It was virtually unthinkable to let a neighbor go hungry. The elderly, crippled, sick, and children were well cared for by the village. A person's goods were not handed down in the family after death, but were dispersed or destroyed. When the Spanish arrived, about 350,000 Native people lived in Alta California, including about 10,000 each of Ohlone, Miwok, and Wintun. The Spanish began their first settlement and mission in San Diego in 1769. San Francisco Mission Dolores was founded in 1776, and the following year the first East Bay mission at Santa Clara. In all, they organized a chain of 21 missions. The missions acquired great wealth by forced Indian labor, the primary economy of the region. Within a short time, the Native peoples' way of life disrupted and destroyed. After a half century of Spanish rule, ended by the Mexican Revolution of 1821, the Native population was reduced by over 2/3rds. Californio settlers from Mexico, many artisans among them, arrived in groups that were cooperative en route, then dispersed and lived in ranchos or agricultural settlements near the missions. Californios were never very numerous, and their population peaked around 7,000. There was little private land during the Spanish period. The government did not offer community land grants in California, as they did in New Mexico, where the cooperative ejido system was widespread. Instead, they granted land to individuals for cattle ranching. Most of California land was considered usable primarily for ranching, but over 30 acres was needed for each head, so grants were large. During the entire Spanish period, fewer than thirty land grants were issued. Much of the East Bay, including the sites of Oakland and Berkeley, was granted to the Peralta family as Rancho San Antonio, less than a year before the declaration of the Mexican Republic in 1821. When the new Mexican government took over, it accelerated the land grant program, and there were over 1,000 California land grants by 1840. Between 1840-46 about 1,500 US citizens entered California, mostly in overland emigrant parties from the mid-west. These Anglo-American home seekers, beginning in 1841 with Bidwell's Party of 32 emigrant men, women and children from Missouri, were typically cooperative and collective en route in their wagon trains, with elected leaders. Although some settled together after arriving, most disbanded and each family went its own way. Soon after the American conquest of 1846-48, gold was discovered and people poured into California, thousands in emigrant parties, with San Francisco the dock to prepare for the jump into the gold fields. Over 100 parties of Americans from the mid-west and east flooded in overland in 1849, and large numbers arrived from the east by sea, about 77,000 people in all, exploding the non-Indian population four times, then almost doubling it again the next year. About 20,000 entered from Mexico, Britain, France, Spain, Chile, Peru, Hawaii, China and other countries. The region and the city quickly took on an international character. At the beginning of the Gold Rush, Yerba Buena (soon to be renamed San Francisco) was still a sleepy port town of 812 people, dealing mostly in cowhides and tallow. Almost overnight the entire fabric of Bay Area and California society changed. By the summer of 1849, San Francisco had become a booming commercial center of 5,000, and by 1850, of 25,000. By 1850 over half the population was engaged in mining. All routes to the mines started at San Francisco, and the gold flowed back through it. The Bay Area suddenly became the hub of the region. "Every man was a laborer," a later historian added, "whether or not he had previously been a teacher, lawyer, farmer, mechanic, preacher or sailor. Physical labor was honorable. Class lines and class distinctions were forgotten, and a universal spirit of rough democracy prevailed. This wholehearted democratic spirit of the mining days permeated virtually every phase of early California life." (Cross). California labor historian L. Eaves wrote in 1910, "There were miners' unions in all the camps - meetings where the conditions under which the mines should be worked were freely discussed, and regulations binding upon the community agreed upon. They heartily approved of the prevailing regime of absolute democracy and equality of opportunity, and vigorously opposed all efforts to introduce any class of servile labor." Large numbers also flooded into California looking for land to farm. Most became squatters. Apart from the Spanish and Mexican land grants, most of California was considered public land, and that was where miners and squatters primarily staked claims. There was deep sympathy and solidarity between miners and squatters, for those who failed in the mines commonly turned to farming. Squatting quickly became widespread throughout rural California. In the westward expanding US in the early 1800s, squatting was sanctioned by the 'preemption' acts, which offered a process by which squatting on unsurveyed land could become a legal homestead. (These laws would be superceded by the Homestead Act of 1862.) The first California legislature in 1850 awarded the right of preemption to anyone settled on and improving up to 160 acres of public land. In the fall of 1850, after just two years of boom, the economy tanked hard. Squatting quickly became common in urban areas, including San Francisco. Many urban squatters were former miners. Mutual aid played a predominant role in urban squatter settlements. The squatters claimed that all land should be presumed to be public until legal title should be proven, and in San Francisco a Settlers' Party was formed to protect squatters' rights. In the East Bay the squatter town called Contra Costa was founded in 1850, which would develop into Oakland. There were squatter riots in Sacramento in 1850, put down by two militia companies. In 1856 the State legislature passed another law recognizing squatters' rights, but it was struck down by the state Supreme Court. By the treaty that ended the war, Mexican land grants were to be respected. This involved over eight million acres of the best land in California, held by about 800 people. Almost none of this land was opened to homesteaders, but instead most of it was taken over intact by Anglo-Americans, often by fraud and swindle. Land speculators had a heyday. Most failed miners found themselves stonewalled out of the farming areas. Thousands of small holdings were snatched out from under settlers by false and forged claims. The national land question, debated since the founding of the US, was briefly resolved when Congress passed the Homestead Act of 1862, partly as an incentive to northern workers during the Civil War. California was seen as a social safety value for workers exploited in eastern cities, and as area of social experimentation. But most of this "free" western land, and the best of it, in California as elsewhere, quickly wound up in the pockets of speculators and the railroads. Over 20 million acres of California were granted to the railroads, which quickly came to dominate the state. Only a small percentage of those who poured into the west ever held onto any land. By 1870 the ownership of California land was firmly established in the pattern we have to this day. In 1871 Henry George wrote, "The land of California is already to a large extent monopolized by a few individuals." Out of a population of 600,000 at that time, sixteen men each controlled over 84 square miles, about 500owned half the farmable land in the state, and the vast majority were landless. Industrial worker cooperatives were common in early San Francisco. The Knights of Labor had a presence, and encouraged worker cooperatives with their vision of a Cooperative Commonwealth and their nationwide chain of almost 200 worker cooperatives. In 1867 the San Francisco boot and shoemakers staged a general strike in their industry in protest of reductions of prices for piece work. This was connected with the introduction of Chinese labor. The strike failed and many of the workers formed the United Workingmen's Cooperative Boot and Shoe Manufacturing Company of San Francisco. Two decades later it was still ranked as "one of the most solid business houses in the city." Completion of the transcontinental railroad in 1869 resulted in layoffs of many workers, causing unemployment, and leading to worker cooperatives. In 1870 there were three cooperative foundries in San Francisco, a cooperative saddle and harness company, and five cooperative boot and shoe factories, some of them organized by the shoemaker labor union known as the Knights of St. Crispin. In 1872 the Pacific United Workingmen's Furniture Manufacturing Company organized with a capital stock of $50,000. Historian Clare Horner lists the following worker cooperatives in San Francisco during the early period (with year founded): Carpenters' Eight-Hour Protective Union Co-operative Planing Mill (1867); Journeymen's Co-operative Boot and Shoe Manufactory (1867); United Workmen's Boot and Shoe Factory (1868); Metropolitan Boot and Shoemakers' Union (1868); Women's Co-operative Union (ornamental goods, clothing) (1868); St. Crispin's Co-operative Boot and Shoe Factory (1869); California Co-operative Boot and Shoe Factory (1869); Miners' Foundry (1869); co-operative tailors (1870); Woman's Co-operative Printing Union (1870); Golden State Iron Works (1870); Columbia Foundry (1871); co-operative printing shop (1871); co-operative laundry (1877); Co-operative Watch Repairing Co. (1881). How long many of these worker cooperatives continued is not recorded, but it is likely that most of them succumbed during the wave of repression of the Knights of Labor chain of cooperatives in the years following the Haymarket Massacre of 1886. All Chinese people entered California as contract labor for one of six companies, but many soon set up independent businesses, particularly laundries, often as cooperatives. The six companies were involved in organizing an extensive and very disciplined system of Chinese-American worker cooperatives in the San Francisco area. In 1874 the Italian vegetable farmers of San Francisco organized a very successful cooperative market, the Colombo Market. In 1910 they supplied 95% of all vegetables consumed in the city. All participating farmers sold under a system fixed prices. In rural areas in the 1870s the National Grange of the Patrons of Husbandry organized cooperative stores, creameries, agricultural marketing and purchasing associations, and banks in California. In the following decade the Grange faded, but other rural cooperatives continued, particularly in irrigation, road building, farming, telephones, fruit picking and packing, warehouses, supply purchasing and marketing associations. In 1904 the Cooperative Meat Company of Oakland was organized by the Butchers Union as result of attempt of employers to introduce the 'open shop.' They also opened a sausage factory and operated a branch in East Oakland. Mutual fire insurance was widespread in California. In 1900 there were mutual companies in six counties; by 1909 in 17. The Labor Exchange movement of 1889-1906 spread throughout the west, and ran 22 Exchanges in California. Beginning by organizing barter, a number of these Exchanges became Rochdale stores. Dos Palos Rochdale Co (1896) began as an exchange in 1896 and became the first specifically Rochdale store in California, while it continued to market farmer members' produce. In 1894 the Altrurian Cooperative Councils, based in Oakland, organized the first cooperative store system in the urban Bay Area. In 1899 representatives of a number of co-op stores in rural California communities came together in Oakland and organized the Pacific Coast Cooperative Union (PCCU). A co-op wholesale "Rochdale Wholesale Co." opened in 1900 in San Francisco. At that time there were six stores in California. They set out to organize more stores, as they considered these needed to make the wholesale viable. An organizing bureau was formed, and by the end of 1900, there 28 stores in the Rochdale Family. In 1900 the PCCU and the Rochdale Wholesale Co. had the distinction of being the only cooperatives in the US sending delegates to Europe to the congress of the International Cooperative Alliance. In 1905, out of 65 co-op stores in California, 51 were part of the Rochdale group. Historian Ira Cross wrote in 1905: "In no place is the cooperative movement so strong or so successful as in California." In 1906, there were 100 stores. But the movement in San Francisco was hurt by the earthquake and fire. They moved the wholesale temporarily to Oakland. The financial panic of 1907 hurt many co-op branches. In 1910 there were about 50 stores in California, including San Jose, most in smaller towns. Of these, 46 were organized together in the Rochdale Family. Each store held stock in the Rochdale Wholesale Co. of San Francisco. They were attacked by other wholesalers, which were trying to force Rochdale into bankruptcy. Many stores were weak, and the wholesale needed a bigger movement to support it. In 1910 they reorganized on new plan. Called the California Rochdale Co., they aggressively organized new branches. Branch managers worked under centralized supervision of the manager of Rochdale Wholesale Co. By 1912 they were a chain of 12 branches. They collapsed in 1913, and all branches closed. Rochdale Wholesale Co. was on verge of collapsing, with less than 30 co-op store as members. However, there were still 100 independent associations in California. The Pacific Cooperative League (PCL) was formed in 1913 as an organizing & informational organization. They had 30 co-ops members in California at that time. They began with buying clubs as a mail-order scheme attached to Rochdale Co. The first few years they sold only coal, sugar, and groceries. In 1917 they began to organize local stores. Local members formed 'management committees,' but the managers were selected and supervised by the central organization. In 1919 they had 32 branches in California and Arizona. By 1920 they were extended into OR, WA, ID, NV, NM, & TX. They took over the Rochdale wholesale, and joined the International Cooperative Alliance. In 1921 they had 17 stores and a $4 million volume. But they were soon in an internecine war with the Cooperative League (CL) over centralization. CL, founded in 1916 and based in the east, was the primary national cooperative organization in the US. The PCL was also more radically oriented than the CL, and PCL supported the Seattle General Strike of 1919, while CL condemned it. PCL was refused recognition at the 1920 CL National Congress. In the post-war boom of 1923, PCL collapsed, primarily due to overexpansion. But in the Bay Area, the East Bay Pacific Cooperative League continued and resurfaced as a Self-Help cooperative in 1930. After the economy collapsed in 1929, only 5 co-op stores remained in California. One of the earliest colonies was Anaheim (1858). The site was prepared using Mexican labor; as soon as the workers moved onto it, it was divided, but continued to have many cooperative aspects for some time. There was a long string of colonies in the 1870s and '80s, many involving different immigrant groups: Kingsbury (Swedish), Selma (Danes), Rosendale (English), El Chino, Elizabeth, Citrus. The Italian-Swiss Colony, originating from a San Francisco credit union of immigrant workers, never divided their land, but became a joint-stock company revolving about their vineyard. An historian wrote in 1935, "The land-colonization project, as a means of solving the farm-labor problem dates from a very early period... Land colonization, on a collective basis, has a definite background in California. Most of the early settlements in the state were based upon group colonization; a large number of the rural communities, which later developed into cities, were settled by groups of settlers . . . For many years the practice was for a promoter to purchase a large tract of land, subdivide it into small acreage lots, endow the subdivision with a euphonious name and then proceed to interest some group in (it) as a community. . .Many cooperative and semi experimental 'new life' colonies were established... It is unquestionably true that land-settlement promoters exploited to the full the social idealism of prospective immigrants who wanted to found new communities in California. Some of these early land colonies were advertised as cooperative or semi-cooperative ventures. In fact, some elements of cooperation were to be found in many of the colony settlements. The older colony settlements were, by and large, successful, but as the state grew the colony idea was appropriated by unscrupulous promoters who worked great havoc with their pretentious swindles." (McWilliams) A state legislature inquiry in 1915 of 32 land colony settlements begun between 1900-15 found swindles connected with almost every one. But the vast majority of colonists were not swindlers. Many were part of a larger movement for social justice. The International Workingmen's Association (IWA), organized in 1852 in San Francisco with the leadership of Burnette Haskell, J. J. Martin and Frank Roney, tried to renew the old First International (which had disbanded six years earlier). Haskell was a newspaper editor and a leader of the radical wing of the Knights of Labor. Martin would soon be the main organizer of the area's first successful Seamen's Union. Roney had been a leader of the anti-Kearney faction of the Workingmen's Party of California, and along with Haskell, would be one of the central leaders of the Federated Trades Council. This new IWA met with a fair amount of success over the next several years, which was a time of rising radical worker movements around the country. But during the nation-wide police repression after the Haymarket Massacre of 1886 in Chicago, the IWA dissolved, along with most other radical groups in America. Seventy of the leaders and members, including Haskell and Martin, thereupon formed Kaweah Cooperative Commonwealth, "To illustrate and validate the premises on which the labor movement is based." They homesteaded a tract of 600 acres in Tulare county. Rising at their peak to 300 members, by 1890 they had constructed an 18-mile road and a ferry, published a weekly magazine, operated a sawmill, besides building homes, orchards and gardens. They functioned under a system of labor-checks based on the amount of time worked; the checks were convertible for any item at the community-run store. But reactionary forces in the state soon took note and the US Congress quickly passed a bill creating Sequoia National Forest out of Kaweah under the false grounds that their original homesteads filings had been technically deficient. Two years later the Kaweahns were driven from the land by US cavalry and arrested. The Cooperative Brotherhood of Winters Island, in the Bay near the delta, was begun in 1893 by Erastus Kelsey from the Nationalist Club of Oakland and Kate Nevins, an organizer from the Farmers' Alliance and Populist Party. All three organizations backed cooperativization of the economy; the Alliance organized the largest farmers' cooperative network in the United States, taking up where the National Grange had left off. Winters Island began with 100 members, but probably no more than a third of these ever actually lived there. Their plan for intensive agriculture got underway, yet the entire operation remained dependent on outside members' support. Then the country hurtled into a deep depression and outside money dried up, strangling the colony. The last residents dwindled away about ten years after its founding. Altruria community came out of the Christian Socialist movement, a powerful influence nationwide at the time; its name came from a utopian novel by Wm. Dean Howells. A Berkeley Unitarian minister, Edward Payne, sparked the idea for the colony in 1894. Cooperative Councils were formed on both sides of the Bay. They bought a plot of land near Santa Rosa and thirty people moved onto it, mostly working families, a majority of them artisans. They used labor-checks for their work and practiced equality of goods. There was an entrance fee. They were supported by a string of clubs as far away as Los Angeles. But they had financial problems. Although they had seven houses and a hotel built by the end of their first year, they had to fold, broke into three smaller groups, which stayed together another year, then the entire project dissipated. Meanwhile, however, the Altrurian Cooperative Councils were also organizing their cooperative store system in Oakland. Fort Romie community was begun in 1898 by the San Francisco Salvation Army as an attempt to create "a peasant proprietorship in California by settling the unemployed on the land." They bought a tract in the Salinas Valley, near Soledad, close to a sugar beet factory. The tract was cut up into smaller lots of 10-20 acres and distributed to poor families mostly from San Francisco. By 1903 there were 70 colonist families there, raising beets through collective irrigation and using many cooperative techniques. Although the plan never got beyond this first plot, it was widely held to be a very successful demonstration project. The EPIC movement of 1934 would again take up the idea of settling the urban unemployed on the land. Japanese immigrants formed the cooperative colony of Livingston in 1910. They did so well that state planners began proposing that the government help organize colonies of non-Japanese in the area. The planners also had the racist side motivation of limiting Japanese expansion in the area. With planning from the University of California, Durham and Delhi communities were set up nearby in 1919. But the land chosen was poor and the post-World War I deflation brought both colonies to ruin; both finally disbanded in 1931. Livingston however, flourished until the Japanese internment during World War II. Job Harriman was manager of the San Francisco Altrurian cooperative store in 1895, ran for Vice President of the United States as Gene Debs' running mate in 1900 on the Socialist Party, then came close to being elected the first Socialist mayor of Los Angeles in 1910. In 1914 Harriman led a large group of cooperators out onto land outside Los Angeles to form Llano del Rio Cooperative Colony. Like Kaweah, it grew out of a failed union activist movement. Much of their support and many of their members came from the Bay Area, although the primary base was in southern California. A year after founding they had 150 members and by 1917, a thousand. They operated a printshop, shoemaker, cannery, laundry, bakery, cabinet shop, brick makers, and other industries. But they were constantly harassed by authorities for their radicalism, were beset with organizational problems (they were overly managerial), and found their water rights taken out from under them by the courts. They bought new land in Louisiana, and many moved there while the California bankruptcy court closed Llano. New Llano grew to a peak of over 300 residents during the Great Depression. Self-Help Coops sprang up soon after the economic crash of 1929. A survey in December 1934 counted 310 different groups, with over one-half million members, with people involved in 29 states, about two-thirds of them in about 175 groups in California. Several forms of Self-Help were usually distinguished, although most groups practiced them all to varying degrees: exchange among members, exchange of labor for goods or services, and cooperative production for use, trade or sale. Exchange among members was the most widespread, and commonly involved partial payment in cash. It was only in the later stage of the movement that many groups turned to production, and most never did to an appreciable extent. The groups appeared wherever conditions were ripe among the unemployed and underemployed, particularly near farming areas, It was truly a spontaneous mass movement. Numerically the largest concentration was in Los Angeles county, where about 75,000 people in 107 groups participated in the harvest of fall 1932, Among the earliest in the state were the LA Exchange, started by Bessie Mays, the Compton Relief Association, begun by a group of World War I veterans, and the Unemployed Association of Santa Ana (in Orange county). Since farming areas were easily accessible in the south, most of these groups organized large numbers of people to harvest produce in exchange for a share of the crops. Nearby Orange county was also an area of concentration. In the San Francisco Bay Area the Self-Help movement reached its most sophisticated level of development. The first Bay Area labor exchange was set up by the Pacific Cooperators League of Oakland in 1930. The summer and fall of 1932 saw the biggest blossoming. By spring 1933 there were 22 Self-Help groups in the East Bay, nine in San Francisco and the Peninsula, one in San Jose. The Berkeley Unemployed Association, at 2110 Parker Street, had sections that included sewing, quilting and weaving, shoe repair, barber, food canning and conserving, wood yard, kitchen and dining room, commissary, garage, machine shop, woodshop, mattress factory, and painter and carpenter teams. At their height they involved several hundred people and had full medical and dental coverage. A visitor to the wood shop in December 1934 reported them working on office desks and furniture, as well as fruit lugs for the farm exchange section. They later changed their name to the Berkeley Self-Help Cooperative, typical of many groups who considered themselves no longer unemployed. A few blocks away, on Delaware Street, was the Pacific Cooperative League (PCL), which operated a garage, flour mill, wood yard, store, canning and weaving projects, and ran a newspaper, the Herald of Cooperation, later called the Voice of the Self-Employed. They laid claim to having organized one of the earliest labor exchanges of the Depression, when they traded an Atascadero rancher their harvesting labor for part of his apricot crop in September 1930. The PCL was not a new organization like almost all the rest, but dated back decades, surviving the death of their parent organization and staggering along at a low level until sparked by the Great Depression. The San Jose Unemployed Relief Council (later called the San Jose Self-Help Co-op) was formed by a group of laid-off cannery workers. They soon had a wood yard, a fruit-and-vegetable drying yard, a store, laundry, farm, soap factory, barbershop, shoe shop, commissary, sewing project and contracted for a wide variety of jobs and services. At their height they were about 1200 strong. The Peninsula Economic Exchange, in Palo Alto, was organized by a group of unemployed white collar workers, professionals, and bankrupt merchants. With about a hundred member families, they had a store, a farm, a cannery, woodyard, and fishing boat. Unlike most of the other northern groups, they issued scrip, in-house currency, to members for hours worked. "Scrip exchanges" were more common at first in southern California, but were usually plagued with problems. The most highly developed group in California was the Unemployed Exchange Association (U.X.A. ), begun in 1932 in Oakland with the leadership of Carl Rhodehamel, an unemployed electrical engineer. Beyond organizing barter and labor exchange, they began producing articles for trade and sale. They set up a foundry and machine shop, a woodshop, garage, a soap factory, a print shop, a food conserving project, nursery and adult school. They had eighteen trucks that they'd rebuilt from junk. They branched outside of town, and maintained a woodlot in Dixon, ranches near Modesto and Winters, lumber mills near Oroville and in the Santa Cruz mountains. At their peak they were providing 1500 people with farm produce, medical and dental benefits, auto repair, some housing and other services. They called it Reciprocal Economy. They made no distinction in labor value between men and women, skilled and unskilled. At first they functioned entirely by barter; it was all done on the books, without a circulating scrip. Members could write "orders" (like checks) against their account to other members for services provided. Eventually they began making trades that involved part payment in cash. All work was credited at one hundred points per hour. Members exchanged points earned for their choice of items in the commissary. Each article brought in was given a point value, which approximated the labor time that went into it, with some adjustment for comparable money value. They offered many services for points, including complete medical and dental, garage, nursery school, and barber. They provided some housing and all of their firewood needs. At their peak they would distribute forty tons of food per week to their members. Unions and Self-Help groups often worked together. A good number of workers belonged to both a union and a co-op. Some Self-Help co-ops, such as the San Jose Unemployed Relief Council, were staffed by unionists. Others, such as the U.X.A., decided specifically that they would not seek to take over any jobs already being performed by steadily employed labor. This friendship paid off in mutual solidarity during the San Francisco General Strike. The Self-Help co-ops of the Bay Area were able to move about freely bringing supplies to the strikers, while "normal" commerce was blockaded. Both the unemployed and the strikers had fruit and vegetables "at a time when money could not procure them." While the New Deal famously helped rural America through assisting in organizing co-ops for irrigation, electricity, farming, and other infrastructure, they drew the line at urban worker co-ops, which might challenge the wage system in industries. The New Deal Works Progress Administration (WPA) of 1935 helped with grants to Self-Help co-ops, then also hurt them by not permitting the sale of products made in the co-ops. The WPA struck a mortal blow by not permitting work in Self-Help co-ops to count as WPA hours. Unemployed people desperately needed a cash income, so many - particularly younger people - flooded out of the Self-Help co-ops for WPA jobs. In September 1933, while the U.X.A. 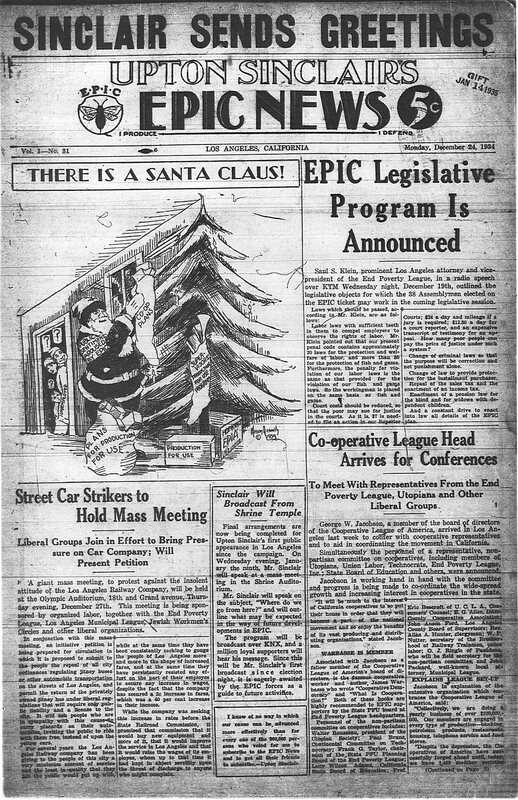 and the other Self-Help co-ops were on an upswing, Upton Sinclair, novelistic chronicler of American social reality, long a leading member of the California Socialist Party, suddenly changed his registration to Democrat and threw his hat into the ring for the Democratic gubernatorial nomination with a program he called EPIC: End Poverty In California. With "Production For Use" as its rallying cry, the EPIC plan proposed creating state agencies to take over idle farms and production facilities and turn them over to the unemployed, to "establish State land colonies whereby the unemployed may become self-sustaining, to acquire factories and production plants whereby the unemployed may produce the basic necessities required for themselves and for the land colonies, and to operate these factories and house and feed and care for the workers..., (to) maintain a distribution system of each other's products..., thus constituting a complete industrial system, a new and self-sustaining world for those our present system cannot employ." "At the end he told me that he was coming out for production for use. I said, 'If you do that, Mr. President, it will elect me.' 'Well,' he said, 'I am going to do it.'" FDR indicated he would come out for the plan during a nationwide radio address scheduled for the week before the election, but in the end FDR said nothing about production for use. Sinclair got 37%, the Republican 49%, and a third party candidate the difference. After the defeat, a large number of EPIC groups planned buying clubs and stores. Over the following year, they succeeded in organizing 210 consumer co-ops in California, with 50,000 members, almost all the groups newly organized. Among the most successful at first were New Day Co-op in Oakland, with 1000 members, and Producers-Consumers Co-op at 668 Haight Street in San Francisco. But these and the great majority of the others soon collapsed. Consumer Cooperatives of Berkeley (CCB) began as one of these buying clubs formed in 1936, soon joining with a Finnish Co-op that started around the same time. It was destined to become the largest and most successful consumer cooperative in the United States at its height in the 1970s, with 100,000 member families. In 1938, the Berkeley Co-op began its first campaign to promote stronger consumer protection laws and expressed solidarity with the labor movement. By 1957 the Berkeley Co-op had become the second largest urban cooperative in the United States. Further expansion resulted in a pharmacy, an arts and crafts co-op, a co-op book store, and a credit union. But along with expansion came problems. The Co-op News debated the issue, "How do we keep democratic control and participation while we continue to expand?" They had close ties with two other Bay Area cooperatives: the Palo Alto Co-op and Associated Cooperatives (AC), the regional wholesale. Both had been founded at about the same time as CCB, and involved some of the same people. Expansion of co-op stores into new areas was fueled by the wholesalers perceived need to be larger to maximize economics of scale. Meanwhile, the Berkeley Co-op's social accomplishments continued to mount. In 1962 they instituted "free speech tables" near entrances for literature and petitions. In 1963 they debated milk contamination from a proposed nearby nuclear power plant; supported a local anti-discrimination housing ordinance; stopped stocking products boycotted by the Central Labor Council. In 1964 they increased minority employment; held a food drive "to aid persons suffering Civil Rights discrimination" in Mississippi; pioneered biodegradable detergent with Co-op label. In 1965 they packaged meat with the better side down; lobbied for a bread and cereal enrichment law; educated on peanut butter additives. In 1966-67 they lobbied for a Fair Packaging and Labeling law; contributed to the United Farm Workers (UFW) co-op in Delano; instituted unit pricing on all shelves; lobbied for regulation of diet foods and for a unit pricing law; agitated against a phone rate increase; labeled all Dow products as boycotted because of their napalm production; assisted the legal defense fund for besieged integrated Southern co-ops. In 1968 they authorized centers to ban smoking; removed all nonunion grapes; withdrew from the Chamber of Commerce because of their consistent opposition to consumer legislation. In 1969 they battled against utility rate hikes; donated food to the Black Panthers children's breakfast program; demanded the "immediate termination" of the military occupation of Berkeley by the National Guard (ordered by Governor Ronald Reagan because of People's Park); posted statements at all co-op centers condemning the war; closed in solidarity during a People's Park protest march and on Vietnam Moratorium Day. At the same time, the co-op was continuously drained by failing expansion stores, and profits continued to spiral down. The truth had to be faced: expansion had failed. There were ten losing stores scattered around the north Bay Area, supported by the three still-thriving Berkeley Co-ops. "Just as the arrow was shot into the air, it fell back to earth," said president Fred Guy, "and in 1983 one by one all the losing operations were closed, at great financial loss, and the Co-op remained briefly with only the centers in Berkeley left, just being a community cooperative, which was perhaps what they should have remained all along." In 1987 CCB filed bankruptcy, followed by the wholesale and the Palo Alto Co-op. The "inter-communalist" Black Panther Party, first organized in Oakland in 1966, ran a host of "survival programs pending political revolution." In Oakland this included a health clinic, free shoe factory, plumbing service, food and clothing, cooperative housing, job-finding service, transportation for elders, breakfast program for children, pest control, busing to prisons for visitors, and prisoners' commissary. All goods and services were free. The Panthers ran communal houses for full-time party workers. Through boycotts they convinced many businesses to recycle some of their profits back into the community through the Panthers' social projects. Starting in the mid-1960s, large numbers of young people worked to create a survival network outside of and against the capitalist system with a common ideological base of working to build a new social system based on cooperation and sharing "within the shell of the old." The mass media called it the "counterculture" or "alternative." It was an era when many people, particularly young people, were searching for a better way to relate to the world and to each other. Many thought that they found it in collective and cooperative work. The world they rejected was based on hierarchy, power, and competition. They wanted a world based on equality, democracy, cooperation, sharing; a way to live and work that could liberate. In the mutual aid and support they found there, they saw the embryo of a new society in which the promises of America could at last become reality. The earliest rumblings of the counterculture probably came with the left's rediscovery of the collective form of organization in the freedom rider groups of the early Civil Rights movement, and in the Anti-Vietnam war and student movements. The collective form of organization helped break through formalistic "democracy" at a moment when a new energy was bursting forth through the social fabric. Within a few years, dozens of these groups sprang up in numerous fields such as the women's, ecology and anti-nuclear movements. Collectives were used to organize almost every activity from education, childcare, art, communications and counseling to legal services and recycling. Almost all the early countercultural forms chose the collective form because participants wanted their means to reflect their ends. These forms ranged from freestores to communes, from "underground" newspapers to collective gardens, including cooperative houses, food conspiracies, and "free" schools and universities. They developed the organizational technology that laid the base for the producer and merchant worker collectives and cooperatives that appeared in widespread areas. Many of the early collectives tried to provide basic social services that capitalist society did not supply. Primarily young professionals formed the free clinics, law collectives and free schools. Others were connected to political movements, like the Young Patriots' clinic in Chicago and the Black Panthers' clinic in Oakland. Most clinics functioned through collectives of physicians, paraprofessionals and volunteers. Almost all had some combination of control by the worker collective and the community. Most of these social service collectives survived through donations and grants. Young people from all over the country were drawn to the San Francisco Bay Area, where conditions, including inexpensive housing, seemed ripe for a new consciousness. By the summer of 1966 the community of young people had grown to such proportions that it began to gather national attention in the news media. Communal households were widespread. A newspaper expressing the new consciousness appeared, the Oracle. The first "Human Be-in" happened that fall in Golden Gate Park. The Haight became the hothouse in which the national movement called the counterculture was born. The group known as the Diggers helped to channel the enormous energy that was exploding into the rudiments of a survival system outside of the old society. They began gathering necessities that were being wasted or hoarded, and redistributed them, organizing free food giveaways and a Freestore. Duplicated around the country, the Freestore was run entirely on collective energy. The idea was simple: people could bring and take what they wanted and needed. But national attention brought a flood of people from all over the country to San Francisco in the summer of 1967, overwhelming the community and making it impossible to continue as it had been. Entrepreneurs looted the Freestore, coming at favorable hours to clean out anything sellable. This resulted in the store being replaced by a free box on the street. Moving beyond the limitations of the Diggers' approach, people soon began setting up more organized structures. "Alternative" news media, primarily "underground" newspapers, grew to mass proportions around the country by the late 1960s, filled with information impossible to come by in the mainstream media. Collectives doing community service work were often "open," and almost anyone could join or participate as an unpaid volunteer. The open collective was for projects that attempted to draw in as much community energy and input as possible. In numerous university towns "free universities" were set up, with courses in subjects ignored by the schools. These eventually gave way to a large variety of "alternative" educational organizations. Numerous collectives of every sort came out of the women's and feminist movements. The collective structure was a natural form, as it provides group empowerment for previously disempowered people. A small collective group started the San Francisco Women's Center in 1970. Over the following years, numerous women inspired by feminist ideology came together spontaneously into small consciousness-raising groups. Out of these developed many service projects, such as the Health Collectives and the Switchboard, to fill gaps not provided for by society; and many women's work collectives, such as Seven Sisters Construction, the Juice Bar, A Woman's Place. The Women's Center and Women's Building became an umbrella organization of about eighteen collective projects. Collectives hit the airwaves. In the Bay Area, listener-sponsored KPFA radio, begun back in 1949 as the flagship of the Pacifica network, struggled and experimented with the issues of collectives and internal democracy in these years. Like the Berkeley Co-op, KPFA earned recognition as a community resource. Collective groups also played an important role in the development of the Bay Area's gay and lesbian communities. The San Francisco Gay Men's Chorus, for example, self-organized in the days following days the assassinations of Supervisor Harvey Milk and Mayor George Moscone in 1978, after an impromptu gathering the night of the tragedy to sing on the steps of city hall. The earliest collective businesses were mostly connected with radical communication media: presses, bookstores and film. This reflected the explicitly political movement from which they emerged. They were followed by food-related cooperatives in the late 1960s, and artisan/industrial collectives and cooperatives beginning around 1970 both in urban and rural areas. Worker collectives and cooperatives represented the embedding of the counterculture in the working population; their revolutionary roots were in workers' control and self-management. They took two basic forms. Some collectives were centralized, with each worker paid through the enterprise. Others, such as artisan cooperatives, were decentralized, maintaining the studio space or the means of production that the craftspeople used. These early cooperative and collective work groups sprang up in many areas around the country. There were soon collective and cooperative bakers, teachers, truckers, mechanics, farmers, carpenters, printers, food-handlers, cabinetmakers, taxi-drivers, medical workers, sellers, artists, technicians, machine-operators, cooks, editors, etc. Cooperatives operated successfully almost everywhere in light production, distribution and services. Cities where the largest concentrations of worker collectives and cooperatives could be found included the San Francisco Bay Area, the Boston area, Seattle, Portland, Minneapolis, New Haven, Austin and Madison. In Berkeley-Oakland, one of the earliest collectives was Taxi Unlimited, collectivized in 1965, in time to play a role in the Free Speech Movement; others included Uncle Ho's Mechanix Rainbow, Movement Motors, Build carpenters, Alternative Food Store, and the Cheeseboard, all formed between 1970 and 1972, followed by Uprisings and Nabalom Bakeries, the Brick Hut and Swallow restaurants. Every loaf of Uprisings bread included a small flier announcing progressive political and cultural events. By the end of the decade, there were over 150 collectives and collective-cooperatives in the San Francisco Bay Area. Due to their underground nature, estimates of the total number of worker cooperatives in the US in this period differ widely. One study published in 1980 estimated between 750 and 1,000 small worker cooperatives in the US at that time. Collectives and cooperatives connected with food cut across rural-urban lines. Of all the countercultural organizations, they became the most interconnected, the most developed ideologically and (apart from music groups) had the most far-reaching effects. In the late 1960s, "food conspiracies" formed in cities and towns across the country. Basically buying clubs, they called themselves conspiracies to indicate that they aspired to more than just stretching dollars, and aimed at overthrowing the established food distribution system. Most had literature and newsletters that publicized their larger motives along with local food news. Most were based on member energy and labor requirements, and run through democratic and collective systems. Many connected with small local and regional organic farms, and made "natural" foods available in their areas for the first time, while providing the farms with needed outlets. According to the Cooperative League, between 5,000 and 10,000 of these clubs had formed across the country by 1975. The Bay Area was a West coast nexus. The Haight-Ashbury Food Conspiracy began in 1968 as a buying club, reaching 150 member houses in 1973. At the same time across the bay, the Berkeley-Oakland Organic Food Association had some twenty-one affiliated neighborhood conspiracies. The conspiracies were organized around member participation. They got food from regional farmers as well as at the Farmers' Market, and were organized so that each neighborhood conspiracy was responsible for one job each month. In the early 1970s, "new wave" co-op stores began appearing, run by worker collectives and many stemming from conspiracies. They differed from the earlier co-op stores in that they were non-managerial. In some, the worker collective comprised the entire membership, while in others workers and member-customers shared control. Meanwhile, natural food stores began to appear, and chain supermarkets also began stocking organic and natural food lines, providing competition at the alternative system's strongest point. The Cooperative League estimated in 1979 that between 5,000 and 10,000 small "new wave" food co-ops of various structures had formed in the past decade, and several thousand were probably still functioning with a 500 million dollar annual volume. When natural food stores began appearing in an area, the buying clubs generally took a dive as the stores were providing most of the same products almost as cheaply and with more convenience. Some of the most active people in the old food conspiracies were instrumental in starting some of the stores, and many of the former conspiracy members formed their customer base. By 1976, both the Haight-Ashbury Food Conspiracy and the Berkeley-Oakland Organic Food Association had lost most of their membership and were in a state of near collapse. The conspiracies and collective stores found that due to their small size they could usually only compete with the supermarket chains in the area of natural foods. In response, the collective stores began forming alternative wholesales, some run by independent collectives, some by federations of stores and conspiracies. Trucking collectives connected the whole into broad interlocking networks on both coasts and the Midwest. Citywide and regional "Food Systems" attempted to grow large enough to create a stable economic base for the whole movement and to create a viable alternative to the supermarket chains. From the Seattle Workers' Brigade and the Portland Area Food System, down to the Southern California Cooperating Communities, across to the Tucson Peoples' Warehouse, the Austin Community Project, Minneapolis Peoples' Warehouse, the Federation of Ohio River Cooperatives (extending over a six state area), and the New England People's Cooperatives, regional Food Systems soon overlapped coast to coast. The collective movement of the era made its greatest impact in the Food Systems. Here the counterculture actually made a frontal challenge to the dominant system in one of its most vital spots, food. It was a real and serious attempt to provide a large-scale collective alternative to the corporate food system, weaving worker-run production units into a larger organism reminiscent of the 19th century Cooperative Commonwealth vision of the Knights of Labor and their coalition with the Farmers' Alliance. Because food is essentially a political issue, many of the most volatile of forces of the 1970s met in the Food Systems, and clashed. The Food System movement became based in "new wave" wholesales and regional federations around the country. As such, these became the center of ideological struggle over the aims and strategy of the counterculture movement by the mid-1970s. Some saw the movement as primarily part of an overall struggle against the capitalist system, and advocated more political involvement. In general, these people thought that the movement should be focused to serve the working population, that it should be anti-profit, that its capital accumulation should not be privately owned by groups of workers or consumers, and that the movement should be more unified and centrally structured. Others saw the movement as primarily economic and personal, and in general supported decentralization, structural diversity, and federation, with each group deciding questions like capital accumulation, profit, or political involvement as it saw fit. There were not two clear-cut camps, as each organization had its own variation of worker vs. consumer control, federation vs. centralization, etc., and there were many different viewpoints within each organization. The mid-1970s was a time of crisis for Food Systems around the country. When many small collectives and cooperatives attempted to federate into larger organizations, they came up against the problem of how to grow large enough to be economically viable without becoming managerial bureaucracies like many of the co-ops started in the 1930s. This, together with the economic recession and runaway inflation, caused most to remain on shaky foundations. The San Francisco People's Food System was formed in 1973 by some of the most active people who had left the old Food Conspiracy and organized the first collective stores. Over its short life, the Food System actively and materially supported a number of progressive struggles, and was instrumental in organizing the alternative People's Bicentennial celebration in San Francisco. Internally, there was a stress on struggling with racism and sexism. The Food System centered on the San Francisco Common-Operating Warehouse (COW). Instead of using the collective structure like most groups, the COW took a structure that in theory combined representative democracy with centralized efficiency, but in practice invested real power in a small self-perpetuating group. It was not long before the Common-Operating Warehouse's system collided with the autonomy and consensus system of most of the member work collectives. In early 1975, SF Food System workers began gathering in regular All-Co-op meetings ("the Forum") to try to develop and better organize the system. By 1976, the System was growing large and strong, with member collectives and co-ops on both sides of the bay. But internally, an ideological battle was brewing over organization, involving anarchists and marxists. In April, members decided that there would be an elected Representative Body (RB). By the end of the year, the Representative Body had drafted a Basis of Unity, which was approved by all the collectives, and the RB elected a steering committee in January 1977. But at that point internal disagreements and problems rushed to a head. A number of the food collectives were involved with the prisoners' rights movement, and there was strong conflict between competing radical prisoner organizations. When a small group disrupted and shut down an All-Worker conference in April 1977. the San Francisco Food System came crashing down and, as it did, a countercultural dream shattered and died. With the SF Food System functionally defunct, the numerous small autonomous collectives again became the main base of the movement in the Bay Area. The following year, the old Food Conspiracy was reorganized and revived as a communal enterprise, with all member-customer energy requirements removed; under this system it grew to sizable proportions again in the Bay Area for a few years. The San Francisco Common-Operating Warehouse hung on for a few years, then closed its doors in February, 1982. Meanwhile, in 1976, a small autonomous Bay Area circle called the Collective Directory Group began a project of networking among collectives. The first edition of the Collective Directory was published in 1977. Updated editions came out in the following years. Besides listing information about groups, expanded Directoriesincluded articles on history and theory of the movement. In 1980, workers from a wide variety of Bay Area collectives came together and formed the InterCollective, an association for exchanging ideas and information, promoting networking, and striving to develop the movement. The InterCollective had no centralized leadership or organization, but gathered in open monthly meetings and held political and cultural events. They organized a well-attendedCollective Conference in 1982, weekly classes and workshops between 1981 and 1986, a Collectives Fair in 1983, and sponsored an anti-nuclear action collective for the 1982 non-violent blockade and civil disobedience at the Livermore Weapons Lab. The Collective Directory became a project of the InterCollective. The 1985 edition was the most extensive, listing almost 150 collective groups in the Bay Area and over 350 on the West coast. But by that time the collective wave had already peaked, the country dominated by Reagan-era economics. The competitive climate engulfed and bankrupted many of the most successful of the worker collectives. Some groups self-destructed. In those years, few new collectives or cooperatives were being formed. The 1985 Collective Directory was the last, and the InterCollective disbanded in 1986. But not all '70s collectives succumbed, and some groups from this era continue today. The Network of Bay Area Worker Cooperatives (NOBAWC) renewed the movement in 1994, after growing out of monthly meetings between several groups to discuss their experiences and common problems, with the mission of information and resource sharing among worker co-ops, and building a movement for worker self-management. NOBAWC is today a member of the US Federation of Worker Cooperatives. Adams, Herbert Baxter. History of Coöperation in the United States. John Hopkins University Studies in Historical and Political Science, Sixth Series. Baltimore: John Hopkins Press, 1888. Collective Directory Group, eds., The Directory of Collectives, (San Francisco: Collective Directory Group & InterCollective, 1977-85). Curl, John. For All The People: Uncovering the Hidden History of Cooperation, Cooperative Movements and Communalism in America. Oakland: PM Press, 2009. Horner, Clare. "Producers" Co-operatives in the United States, 1865-1890. Ph.D. diss., University of Pittsburg, 1978. Knapp, Joseph. The Rise of American Cooperative Enterprise 1620-1920. Danville: Interstate, 1969. Knapp, Joseph. The Advance of American Cooperative Enterprise 1920-1945. Danville: Interstate, 1973. Parker, Florence E. The First 125 Years: A History of Distributive and Service Cooperation in the United States, 1829-1954. Superior: Cooperative League, 1956. Shinn, C. H. 'Cooperation on the Pacific Coast.' Adams, Herbert Baxter. History of Coöperation in the United States. John Hopkins University Studies in Historical and Political Science, Sixth Series. Baltimore: John Hopkins Press, 1888.